Puppet Showmen tend to philosophy. There was, for instance, till yesterday, Old Clunn Lewis, with his harp and his quality as a Franciscan tertiary. Much lore about life he, the last of the wandering Friars in English lanes, had gained from Mother Shipton, Maria Martin, the dancing hostlers and other figures of his troupe. Then there was Mr Codlin, who lurked within Mr Punch's show, Diogenes-wise and exuded cynicism. 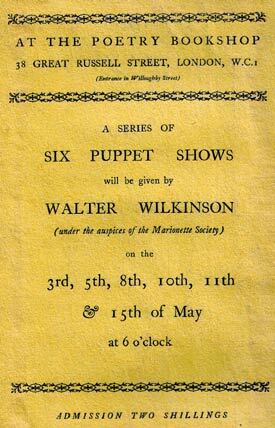 Then there was the showman in Hans Andersen's tale who would have his puppets endowed with life by the student of magic and already Mr Walter Wilkinson, we fear, is in a rage with us, just as he was in a rage with the two pedants who watched him doing his show under the larch-trees at Paradise, which is just above the Adam and Eve Inn, on the slopes of Painswick Beacon, in the Cotswolds and "talked pompously about some delightful scene in some book or other of which it reminded them" - with their backs to the puppets, too. Mr Wilkinson abhors comparisons; he begs you to take him just for what he is. In that desire to get out of the rank and rediscover his individuality, as man and artist, we find the motive-force of this amateur-professional (why put asunder characters that God evidently meant should be joined?) who fared on foot, rejoicing, round Devon and Somerset and home again with his tent and his "Peep Show" and made a diary as he went that at once claims the next place to Sanger's memoirs in the classics of showmanship. If Mr Wilkinson handles his puppets as deftly as he handles his pen, we would tramp a good many miles to see them. The "Peep Show," we must explain, was a Punch and Judy show, but without Punch, Judy, or Toby. Mr Wilkinson - argumentative like all showmen - explains why he sacked these venerable tragedians. They have a knack of frightening the children, which is true, but we feel, not his real reason for discarding them. "Surely," he cries, "the whole British nation, of how many millions I do not know, need not be slaves to this one idea." There you have it. Mr Wilkinson saw no fun in submissively carrying on a tradition, however sacred. He seized "a stout piece of walnut-wood" and a chisel and presently sat surrounded by a gay and grinning family all agog for adventure - John Barleycorn, Uncle Joe, Old Martha, Pretty Sally, Cheeky Pipi, the Rev Mr Black and the Monkey. With these and few simple scenes running in his head, he pushed out into the sunshine and the rain of the English road. I was undoubtedly the last of the pedestrians. I found myself more Quixotic than the Don himself, for I was wandering on foot in a world of cars, cycles and flying machines - a handicraftsman lost in an unapproachable, mechanical world. If I did pick up with a chance acquaintance, it was to expose myself to searching questions as to who I was, where did I come from and how much money did I make ... I was wandering romantically where there was no romance. I could come across no one but deadly serious business people who all knew how I ought to conduct my business and make it pay. This was the worst of it. But then, the best of it - how heavily that best weighted down the scale! Collections seem only to have averaged about four shillings a day and not every day brought its collection, but it mattered little to a man who ate no flesh, carried his lodgings with him and accepted rain with an indomitable cheerfulness. And there was clambering to the summit of the lonely world on the edge of Exmoor, "alone with the fields, with the wild birds, with a great stormy sky and the wind," pulling up by cross-road ponds, "blue with reflected sky on which the whitest of ducks were sailing," sleeping in orchards and waking early to strip the meadows of mushrooms and invite Aurora to breakfast. There was the thrill of discovering on which side the farmer has a blind eye for trespassers, beneath which button of his tunic the village constable keeps a human heart, how to turn rivals on the fairground into pals and when the last of the old Punch and Judy men still flit about shy tap rooms and distant strips of beach - if it was not Mr Codlin, who was it, who complained to Mr Wilkinson that his wife had "run away with his illusions" (by which it turned out that he referred to a conjuring outfit) and who pronounced puppetry "Too 'ard work! When you get the bloomin' Punch up 'e seems to weigh pounds". 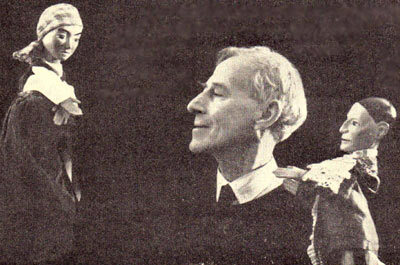 Above all, there was the joyful disclosure that all the world agrees with Hazlitt in "liking a puppet-show the best of all," from the insatiable children to the forefather of the hamlet, who, meeting the showman as he pulled out from Parracombe, roared frenziedly, "What, just finished! Noa, dang it arl! I wish I'd 'ad knowed. Dang it! Nobuddy towld I aboot it! Dang it! If I'd 'ad knowed I'd ud been there." If I were a philosopher expounding a new theory of living, inventing a new "ism," I should call myself a holidayist, for it seems to me that the one thing the world needs to put it right is a holiday. There is no doubt whatever about the sort of life nice people want to lead. Whenever they get the chance, what do they do, but go away into the country or to the seaside, take off their collars and ties and have a good time playing at childish games and contriving to eat some simple food very happily without all the encumbrances of chairs and tables. - And enjoying a show so simple that its potentialities are limited by the two hands of the showman and the four feet of his miniature stage. But that it could enchant even the high-brows, Mr Wilkinson proved when he showed, like a medieval jongleur at a great house in Glastonbury. And there in the Isle of Avalon by the Chalice Well, linking the romance of the tiny companions of his journey to that of the august wanderer who founded the shrine, we may take cordial leave of this Chaucerian Merryman.